Human activities are thought to have impacted upon the populations’ viability, including: insecticide use; loss of habitat; the introduction of exotic fauna and climate change. The sensitivity of amphibians’ skin to their surroundings makes them susceptible to chemicals and pollutants that often make their way into the environment from waterways. Overharvesting and disease also impacts frog and toad populations. Frogs cannot live in the sea or any salt water and because frogs come out in the rain, people used to think that they fell to earth in the rain! Creating a pond or bog garden may encourage native frogs to visit your garden, but remember that they are not a replacement for good waterways management. They may, however, provide a place for amphibians to reside and breed in the correct conditions. Hearing the call of frogs any evening is a fantastic sound (frogs can be vocal – especially at night) but remember that not all your neighbours may agree, so think carefully about where you place your pond/bog. Certain frogs can jump up to 20 times their own body length in a single leap and love gutters, downpipes even self watering plant pots and bird baths, especially when filled with rainwater. Vegetation also attracts insects to your garden for frogs to eat. A rock pile or fallen logs work well to keep the area shaded and cool. Plant native shrubs of different heights and ground cover around the pond to give frogs a comfy resting place, hiding spots from predators and shelter from wind. A frog pond should be spoon-shaped with shallow, sloping walls. This allows easy access for the frogs to get in and out of the pond. Styrofoam boxes, children's pools and old laundry tubs can all make good frog ponds. If the sides are steep, build a ramp using sand, gravel, rocks, logs or tree branches. You could also dig your own pond, and line it with plastic to stop the water escaping. The water will need to be free from chemicals, so let tap water stand for a week before putting it in your frog pond. Add plenty of swamp plants in trays or pots in the shallowest region, and place a few potted aquatic plants and water lilies further down. Cover their soil with sand. The waterweeds will provide habitat for the tadpoles and baby fish to shelter in while they are small and vulnerable to predators. Download our 'Some frog friendly native plants...' to help with your plant selection. Some types of fish, like Rainbow fish are frog-friendly and also help control mosquitoes. Some people add local stream insects such as backswimmers and damselfly larvae instead. Never place Goldfish or Mosquito Fish in your pond as they are poisonous to frogs or eat their tadpoles. While the frogs will eat mosquitoes the presence of mosquito larvae in the pond will also need to be monitored and kept in check through a range of natural control measures. Microbats are also effective mosquito predators and you may consider installing a microbat box in a tree near your frog pond. Be patient! Frogs sometimes take up to two years to begin settling in your garden. If frogs don't move in of their own accord, you might need a permit to introduce them. Check with your state wildlife authority before introducing frogs or tadpoles. Bromeliads come from tropical parts of the Americas and are an interesting group of plants with over 3000 described species in approximately 56 genera. Some bromeliads are epiphytic (grow on trees or other objects for support) while some require soil for their roots – including the most well-known member of the family – the pineapple plant (Ananas comosus). Bromeliads are very easy to grow in warm and temperate climates, and have an amazing range of foliage, flower shapes and colours. Most bromeliads grow in a rosette form with a central well, and their unusual flowers grow from the central well. The blade leaves of bromeliads funnel a lot of water into the central well, providing moisture for insects and other small creatures in times of drought, and the insects provide organic matter to fertilise the plants. This regular supply of food and water attracts frogs. If you like having frogs in your garden, try growing some bromeliad genera – Aechmea, Billbergia, Neoregalia, Vriesea or Wittrockia — which have soft, leathery, broad leaves and grow best in part shade around the base of trees. 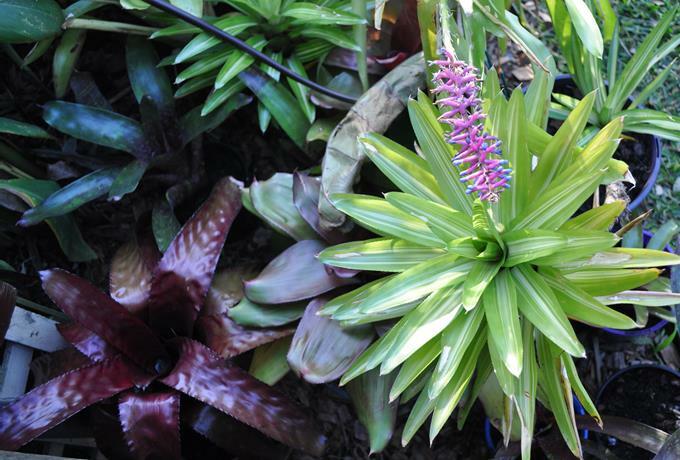 These bromeliads rely mostly on their central well for water and food, and use soil mainly for support. The rosette of leaves provides a hiding place for frogs and the colourful flowers also give the frogs an ideal vantage point to catch insects. Where you plant bromeliads you create a natural habitat for frogs. Bromeliads require shade and good drainage, they don’t like sitting in water, direct sun or frost.